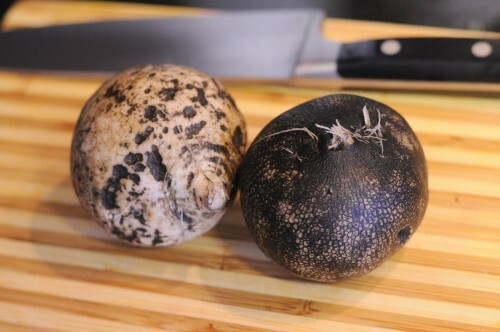 A very slight hint of winter just appeared in the air this morning, and pretty soon you might encounter the black radish (also known as black Spanish, black Spanish round, or in French, Gros Noir d’Hiver) and like I did, wonder what it is. Is it a beet, a radish, a potato, or simply an adventure? I found it at the Food Coop and grabbed it without any plans for its consumption. I come home with my loot often with surprises – oddly shaped crop I’d have to consult Google on how to prepare, strange grains and fruit – and enough hope to create a healthy, unique meal to share. 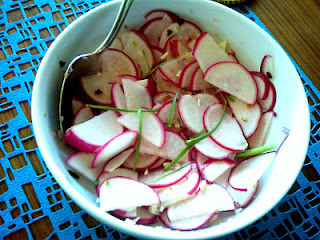 This entry was posted in cooking, Recipes, vegan, vegetable and tagged radish, vegetable on August 30, 2012 by admin. Brussels sprouts are very versatile, tasty and easy to make as a side. We begin with some crushed garlic in oil. When garlic is brown, add the brussels sprouts. Shake around to coat in oil. Sprinkle with salt and if feeling generous, a square of butter. For this meal, I served it with bistek Filipino pork chops and homemade miso soup. 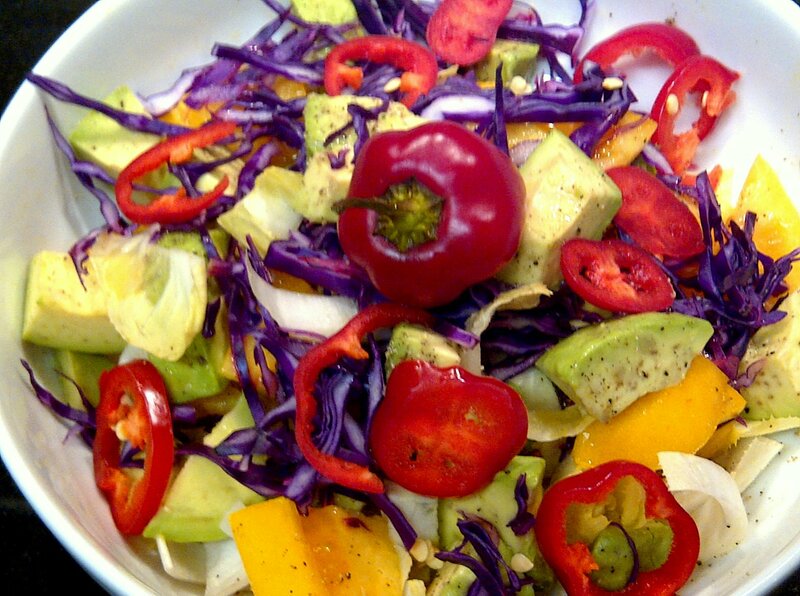 This entry was posted in cooking, homemade, Recipes, vegetable and tagged brussels sprouts, vegetable on January 7, 2012 by admin. A simple and tasty soup to make for when you’ve kept the butternut squash from the Food Coop for a while and it’s cold outside. I’ve tasted a lot of things in restaurant winter squash soups and have been toying around with adding some herbs like nutmeg or other vegetables like celery, but squashes are so sweet and tasty that it’s hard to go wrong relying on their own flavor. Cut and remove seeds from one butternut squash. Coat with olive oil and bake in a glass dish for an hour at 375C. Peel the squash pieces with a knife. 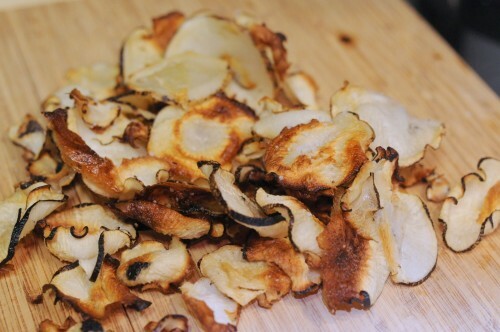 Cut cooked squash into squares. Saute some garlic in oil until brown. Add the squash and mix it up. Add about 2 cups of water and crush the squash with a ladle. Add one vegetable bouillon (or replace all water with vegetable broth). If you don’t have one, cool the mixture and use a regular blender, then return to pot. Puree as needed and add two more cups of water depending on desired consistency. Simmer covered for about 10 minutes, mixing occassionally. Serve hot in a bowl. Top with chives or scallions before serving. This entry was posted in homemade, Recipes, soup, vegan, vegetable, winter and tagged butternut squash, soup on December 28, 2011 by admin. Trying to eat fresh and healthy can become boring after many, repetitive salads. Here are some ideas to mix things up a little bit. It helps to have a fully stocked fridge to be creative. 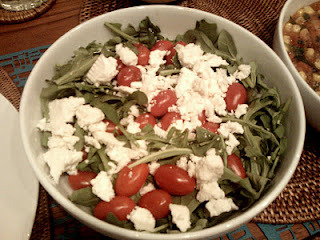 Arugula, grape tomatoes, goat cheese. 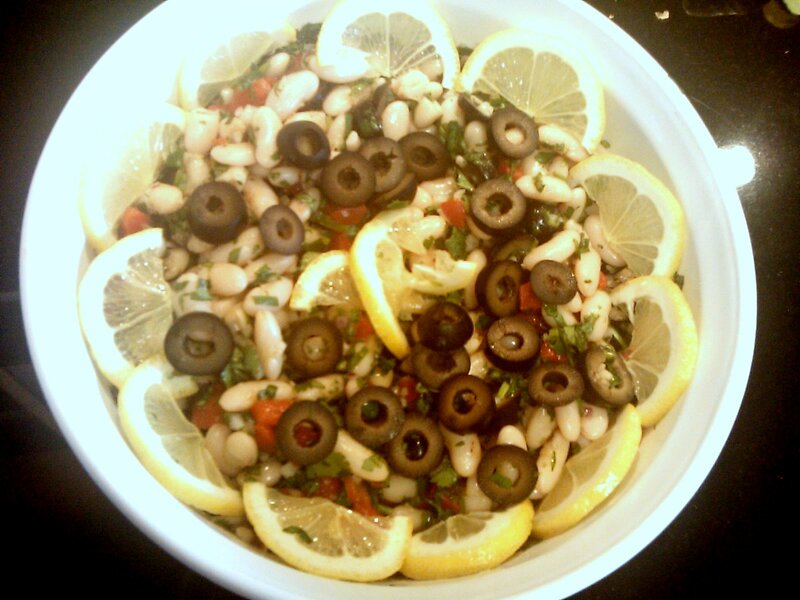 Olives, roasted peppers, white kidney beans and lemons. Red radish, lime vinaigrette, and garlic scapes. Tomato slices, basil leaves and burata cheese. Sweet peppers, avocado, red cabbage and lemon. 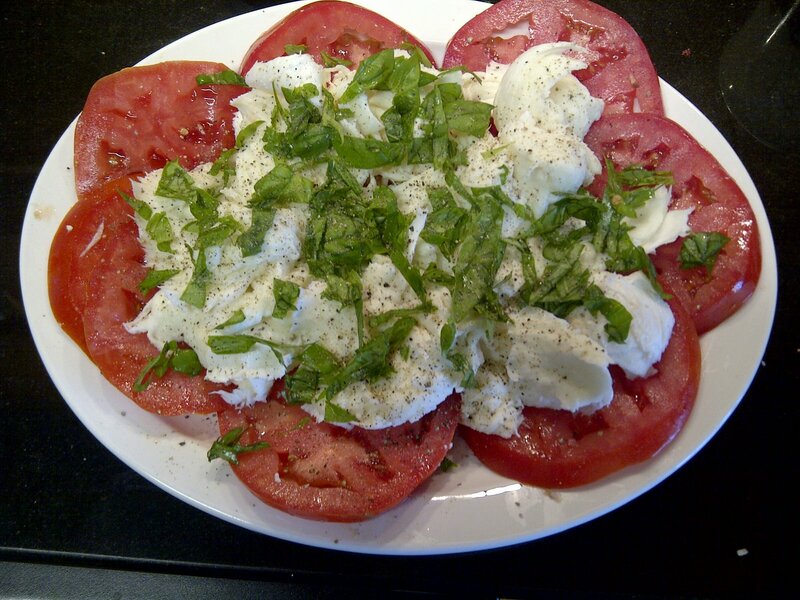 This entry was posted in healthy, homemade, Recipes, salad, vegetable on July 29, 2011 by admin.